A colleague and I are running a workshop for high school teachers this week, and we plan to use App Inventor (which will now live at the MIT Media lab). So I had a play around with app inventor and it is so easy to get started. The beginner app is one where the kitty purrs when you pet it. Useless. Yet given the popularity of cats on the web… genius. I followed the setup instructions here. It took maybe 30 minutes to get everything installed and have the app done and running on the emulator. Downloading things and waiting for things to start was the bulk of that (it’s slower first time, apparently). It’s annoying to have so many windows – I feel like this was designed with a big monitor rather than a small (I was using my 15″ pro) laptop screen in mind, but at least they are all different programs so switching between them (via the dock or cmd+tab on the mac) is not too bad. I didn’t package the application for a phone (I don’t have an Android device) but that looks to be pretty simple too. Overall, I’m really looking forward to playing more around with it. 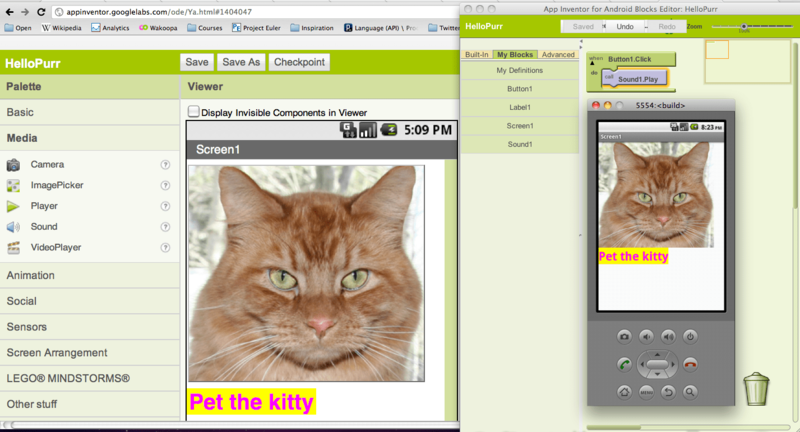 It’s a bit like Multimedia Fusion for app-development. I’m not a huge fan of teaching “programming” via visual means, but teaching “game development” or “app development” and sneaking in some programming and making kids want to take it to the next level is something else. I’ve found that to be a pretty successful strategy! I have decided to go forward and use App Inventor for my Grade 10 Introduction to Computer programming class. Thank you for the workshop at UW and it would be great if you would be able to come and speak to my CS classes in Toronto later this year.